The kitchen and the living area are increasingly connected, in a seamless arrangement of continuity, creating a highly personalized environment that responds to individual habitat needs. This is the design revolution with which Modulnova confirms its prowess in pursuit of solutions that are more innovative than ever in terms of aesthetics and functional quality. 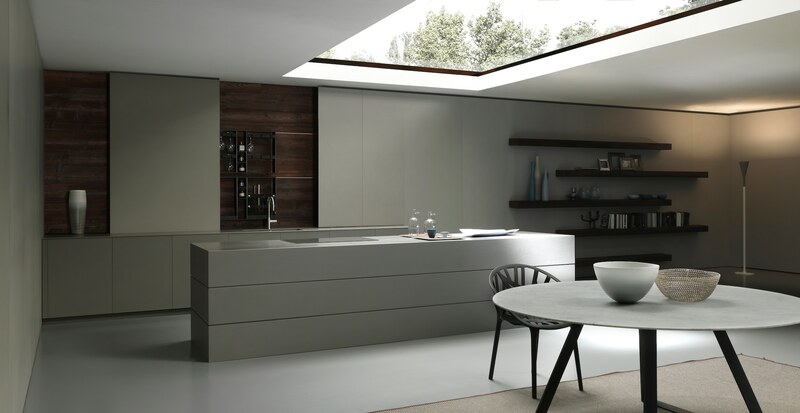 Once again, Blade – designed by Andrea Bassanello – becomes the territory of experimentation: the program with which the Friuli-based company applies to the kitchen an architectural concept already deployed for the living area. 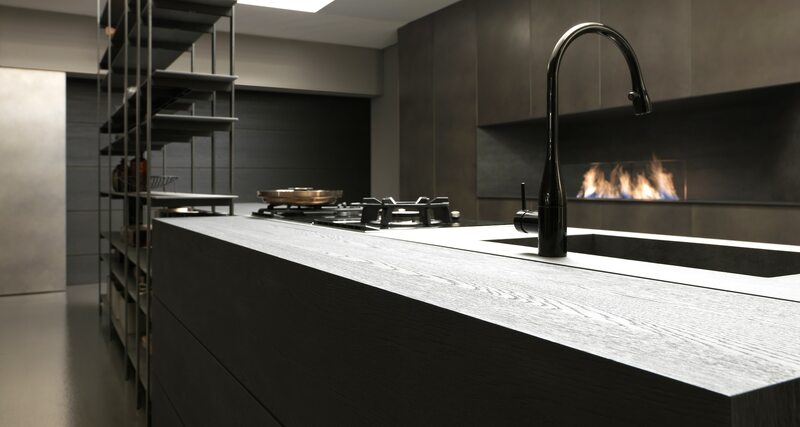 The refined, contemporary design and the absolute versatility in the choice of materials (aluminium, glass, wood and resin) and finishes make Blade the ideal system to interpret a new aesthetic conception of the kitchen. The large floor-to-ceiling doors without baseboards and handles proposed for the living zone reappear in the kitchen, creating an effect of extreme elegance. The “traditional” volumes – determined by spaces for storage, or columns – vanish in favor of stylistic continuity of exceptional harmony. This is the new aesthetic and design language of Modulnova: the cabinets become an integral part of the basic architectural project and are perfectly inserted in the space without “compromising” its volumes. All this, of course, without sacrificing functional quality, which remains a fundamental prerogative of every Modulnova project. An important expansion of the range of finishes, with the introduction of a series of new metallic materials, including aged brass and a very ‘underground’ sheet-metal effect, completes the Blade proposal aimed at a refined consumer who appreciates the unique, unmistakable style of Modulnova. 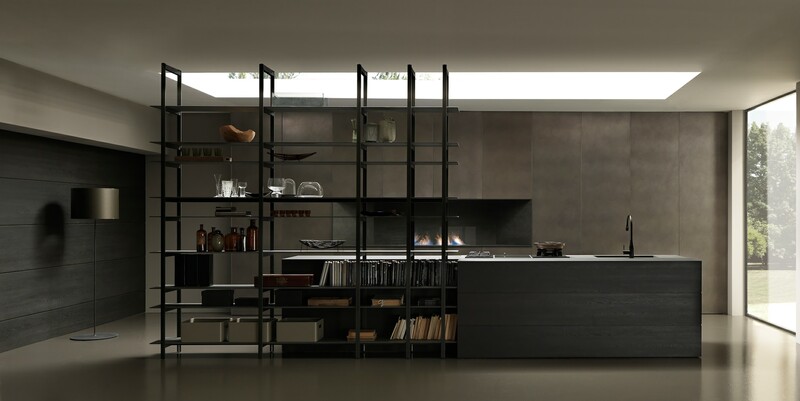 View of the Blade kitchen by Modulnova with shelving in Savoia stoneware and iron posts. Tops, backs and sides of the Blade kitchen by Modulnova made with the folding technique. 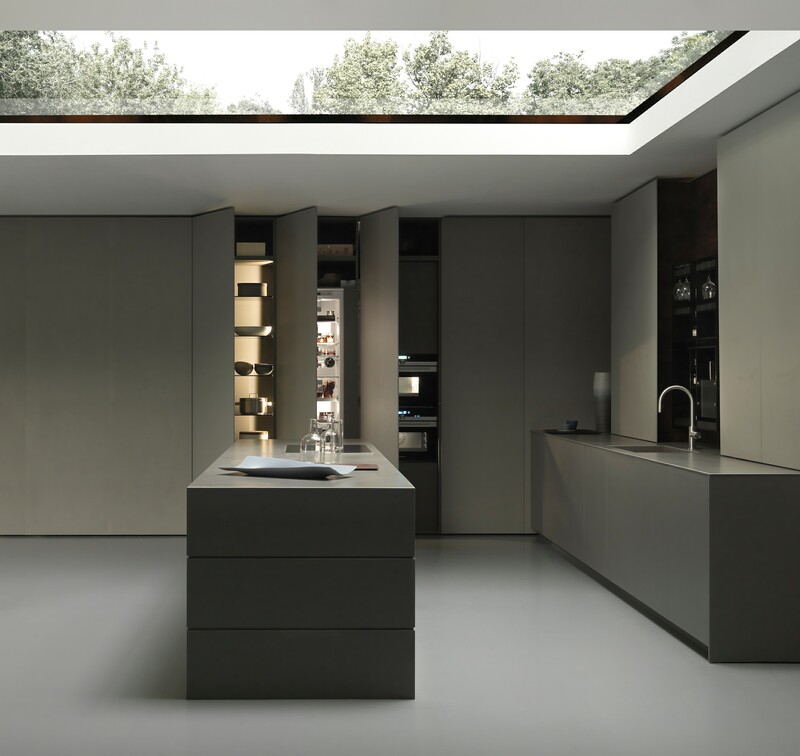 Large floor-to-ceiling doors of the Blade kitchen by Modulnova in epoxy lacquer, without baseboards and handles. 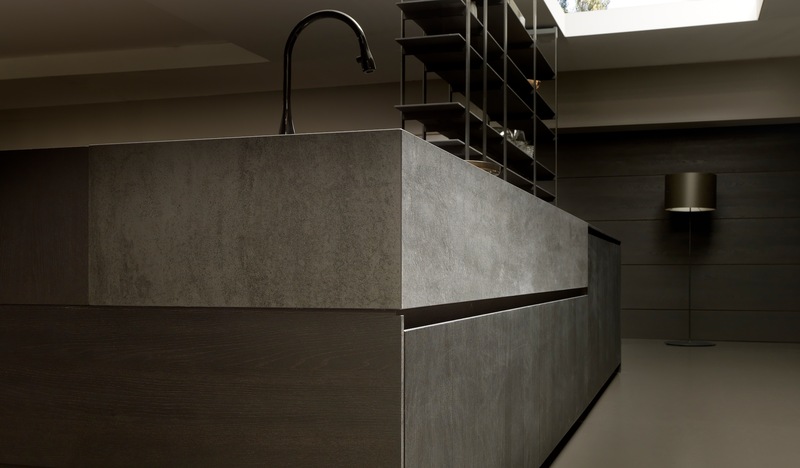 Top of the Blade kitchen by Modulnova fumé oak and Savoia stoneware. Sink in Savoia stoneware. 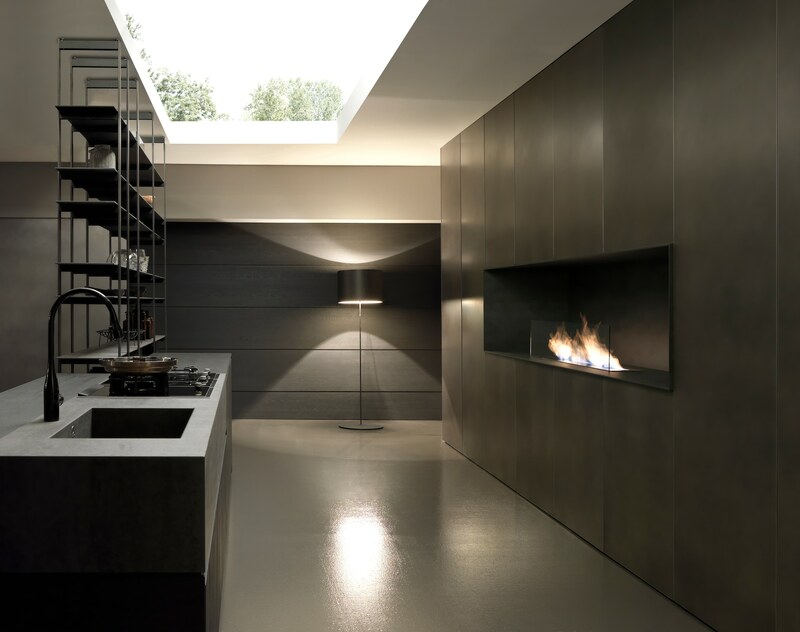 View of the Blade kitchen by Modulnova and living area with Iron table in Carrara marble. Handles of the Blade kitchen by Modulnova with push-to-open system. Sides and base of the Blade kitchen by Modulnova, in new plumb resin. Top in Avenue XXL plumb ceramic. 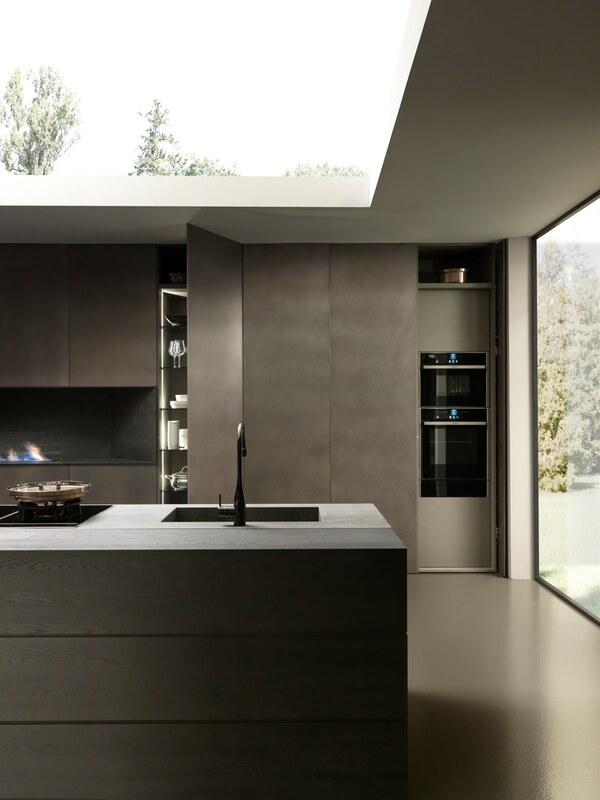 In the Blade kitchen system by Modulnova the cabinets are perfectly inserted in the living space, without encumbering its volumes and, obviously, without sacrificing functional quality.